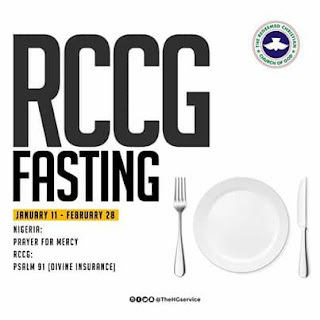 The General Overseer of the Redeemed Christian Church of God, Pastor Enoch A. Adeboye has announced the fasting days for the year 2019, it is to run from the 11th day of January 2019 till the 28th of February 2019 (49 days). The focus for the Fasting and Prayers this year is to Pray for mercy taking the anchor scripture from Psalms 91. That part of the Bible in its simplest form is that God is giving us Divine Insurance all through the year 2019 and beyond. - If one misses a day of fast, that individual is meant to compensate it with two extra days.